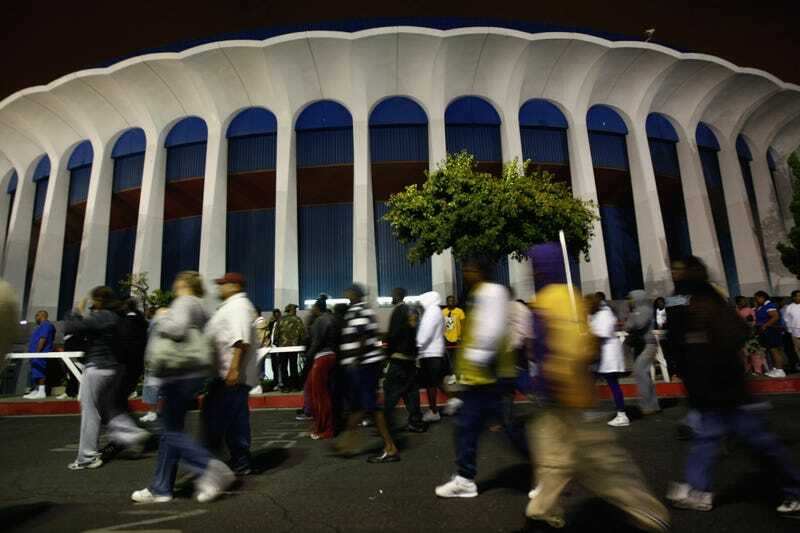 The Forum in Inglewood, Calif.
By now, we have all heard the stories of how hard Nipsey Hussle was working to keep his Hyde Park neighborhood from becoming gentrified. For years, the area has been inhabited almost exclusively by blacks, but as the city’s Metro has been constructing a new train that will take travelers down Crenshaw Boulevard and eventually deposit them near Los Angeles’ busiest airport, developers have found the area ripe for the picking. Many watched this same type of situation play out on HBO’s Insecure, when the main character, played by Issa Rae, had to move out of her Inglewood apartment because gentrification priced her out and made it impossible for her to stay there on her own. At a March 5 city council meeting, Inglewood Mayor James T. Butts Jr. proposed a 45-day moratorium that capped rent increases at 5 percent and halted evictions while the city tries to come up with a more viable solution for the problem. The city council voted unanimously to adopt the proposal, and there is an option to extend the measure for a full year. But again, that is a temporary fix to an ongoing problem that has already affected many in the area. And so another historically black neighborhood in Los Angeles gets whitewashed and those who have lived there the longest are powerless to stop it.